Accelerated Mobile Pages (AMP) - how they can help your SEO! AMP, short for Accelerated Mobile Pages, is a project by Google with the aim to speed up the web experience for mobile users. By implementing AMP your website's pages will load faster for mobile visitors and will stand out (slightly) more in Google's result pages. Strictness of the AMP standard may lead to not being able to offer all of your website's functionality to mobile users. You'll have to give up more control to Google. Support for ads is (currently) limited. Implementation may require development resources. Make sure to do a proper costs/benefits analysis before deciding to implement AMP. Why should you care about AMP? 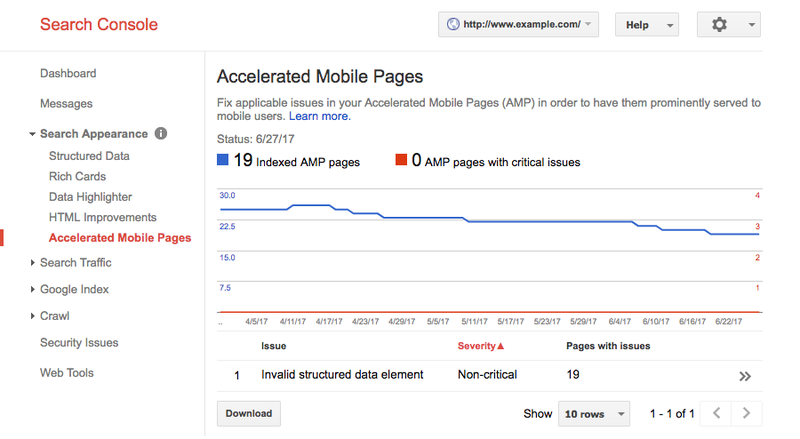 AMP stands for Accelerated Mobile Page. It’s an open-source initiative and format by Google with the aim to speed up the web experience for mobile users. AMP pages are essentially stripped down versions of pages which are optimized to load fast on mobile devices. AMP helps you serve fast loading pages to your visitors through optimized code, caching and Google’s Content Delivery Network (CDN). Fast loading pages will likely increase your conversion rate and give your rankings a small boost. Google’s announced to switch to a mobile-first index. This is likely to happen somewhere in 2018. This means that your desktop website will not be leading anymore in determining your rankings. Instead, your mobile website will take over this role. Adopting AMP can help you prepare for this. Furthermore, Google promotes AMP websites in its search engine result pages. 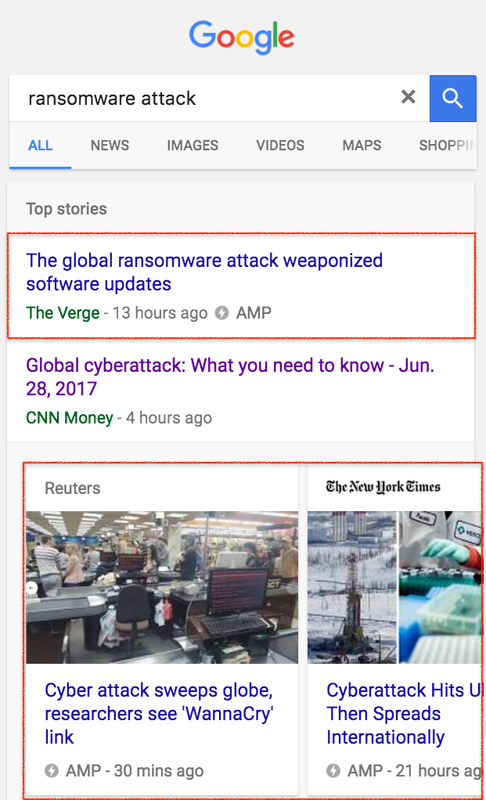 For news websites that employ AMP Google may show a news carousel. For regular pages Google may show the AMP lightning bolt under the result. So besides a good mobile experience, AMP also offers extra attention in Google’s SERP. Implementing AMP requires you to make your pages available in an alternative format according to the specifications of the AMP standard. This means that the AMP version of your pages will exist alongside your regular pages. The AMP specifications are well documented and easily accessible, but may require development resources for implementation. Fortunately AMP extensions for well-known Content Management Systems such as WordPress are springing up here and there, making the implementation significantly simpler. When implementing AMP it’s paramount to stick closely to the specifications and to validate your AMP pages before publishing. After publishing your AMP pages it’s a good idea to run them through Google’s AMP testing tool. Also make sure you have your website verified in Google Search Console. There you’ll receive feedback from Google on your implementation of AMP. Choose a logical URL for your AMP pages, preferably as a child-item of the original page. Let’s say you have a page at https://www.example.com/ice-cream/. Then a logical URL for the AMP-version would be: https://www.example.com/ice-cream/amp/. Once your AMP implementation is done you’ll have two variants of your pages: the regular (“non-AMP”) version and the AMP-version. It’s important to make this relationship clear to search engines. On the regular page this is done through the link rel=”amphtml” attribute. On the AMP page this is done with the canonical URL. In case you have a website with only AMP pages, the AMP pages should have a canonical URL to itself. Google recommends tracking AMP pages in a separate Google Analytics property to be able to properly compare statistics of non-AMP pages and AMP pages. Similar to your non AMP pages, your AMP pages should be working properly. You don’t want to reference AMP pages that don’t return a HTTP status 200 OK.
Due to the strictness of the AMP implementation guidelines, you may not be able to offer all of the functionality of your regular website. This is especially limiting for functionality-rich websites such as eCommerce websites and therefore we don’t recommend using AMP in those cases. People are concerned about giving Google even more control over how and when to show your content. Google will act in their best interests, which may be misaligned with your best interests. Lots of websites rely on ads to generate revenue. AMP currently only has limited support for displaying ads. AMP helps web pages load faster, but it’s not the magic bullet which is going to make you successful. It helps to load your content faster, but if your content doesn’t add any value this won’t help you. In short: pagespeed is a (minor) factor in Google’s algorithm but it’s not going to magically rank you number 1. AMP sounds interesting, should I implement it? Should I add my AMP pages to my XML sitemap? Why am I seeing more traffic and less engagement after implementing AMP? 1. AMP sounds interesting, should I implement it? It’s worth noting that AMP is certainly not the only way to offer users a good mobile experience. Responsive web design helps you to deliver a good experience to your mobile users. Optimizing your source code and images, combined with caching and the use of a Content Delivery Network (CDN) helps you to serve fast-loading pages to your users. If you have that you basically have the same as you would have had with AMP, plus you keep full control over your content and the functionality you’re offering to your users. Does your website offer extensive functionality instead of mere plain content to your mobile users? Then probably you shouldn’t implement AMP. Is your website already optimized for mobile traffic through responsive web design and page speed optimization? Then you won’t benefit much from AMP and it’s probably not worth the hassle. Is your website relying on ads to stay afloat? Since ad support is limited in AMP, you probably should not implement AMP. Are you a content publisher and you’re seeing month after month a decline in organic search traffic because your competition did implement AMP? That’s a good signal to implement AMP as well. Do you have a content-rich website that serves as a lead generator? Then it may also make sense to look into AMP. Having AMP makes your pages stand out more, leading to more clicks and more traffic. 2. Should I add my AMP pages to my XML sitemap? If you’re using AMP and non AMP pages you don’t have to add your AMP pages to your XML sitemap. The rel=”amphtml” provides enough signals for Google to discover the AMP pages according to Google’s John Mueller. In case you’ve using standalone AMP pages (website consisting of AMP pages only), you do need to include the AMP pages in your XML sitemap. 3. Why am I seeing more traffic and less engagement after implementing AMP? Tracking of visitors on AMP pages isn’t perfect yet. Returning visitors may be counted twice. Visitors interacting with the news carousel may just quickly skip through your article without really interacting with it. AMP content often offers less functionality to interact with the content, bringing down engagement. It’s important to rethink your KPIs when it comes to AMP pages. Quickly check if AMP is implemented correctly!